The following table lists the Image Processing Toolbox™ functions that have been enabled for code generation. 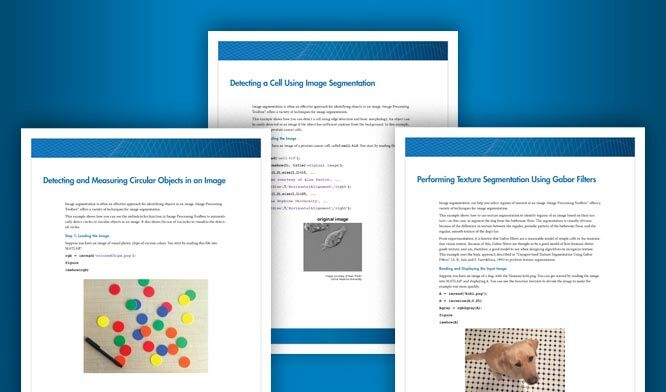 You must have the MATLAB® Coder™ software installed to generate C code from MATLAB for these functions. Functions that generate C code. Functions that generate C code that depends on a platform-specific shared library (.dll, .so, or .dylib). Use of a shared library preserves performance optimizations in these functions, but this limits the target platforms for which you can generate code. For more information, see Code Generation for Image Processing. Functions that generate C code or C code that depends on a shared library, depending on which target platform you specify in MATLAB Coder. If you specify the generic MATLAB Host Computer target platform, these functions generate C code that depends on a shared library. If you specify any other target platform, these functions generate C code. In generated code, each supported toolbox function has the same name, arguments, and functionality as its Image Processing Toolbox counterpart. However, some functions have limitations. The following table includes information about code generation limitations that might exist for each function. In the following table, all the functions generate C code. The table identifies those functions that generate C code that depends on a shared library, and those functions that can do both, depending on which target platform you choose. An asterisk (*) indicates that the reference page has usage notes and limitations for C/C++ code generation.